Indecisiveness is an issue for Cocona, with the latest instance being which high school she wants to attend, despite having sterling grades. Living a seemingly normal life at home with her grandma, things in Cocona’s life take a drastic turn towards the surreal when she meets Papika, a strange and affable girl who rides around on a flying surfboard. Together, they travel to the world of Pure Illusion, where fantastical adventures await them, though, there’s far more to the world of Pure Illusion than meets the eye… . All right, that doesn’t sound so different, but since a synopsis can often be misleading, let’s start this off by saying that the story in Flip Flappers is probably its biggest strength, as well as its greatest weakness. For the first handful of episodes, the plot feels a bit random, and you’re left unsure of what exactly the show is going for. There isn’t enough explained, and even though the show is still very entertaining, not knowing quite enough about the characters and pussyfooting around its more ambitious story elements made me feel like there was some wasted opportunity early on. The trippy, fairy tale-like world of episode two, the Mad Max-esque post-apocalyptic desert world of episode three, and the nightmarish, yuri-fied version of their school from episode five were all great, but there just wasn’t enough plot progression for my liking. Around the midway mark, however, we see the story start to settle in and begin delivering more character development, as well as a clearer picture of what is really going on. There’s still much to be inferred, but at least there’s progress. From an emotional perspective, episode six was particularly strong, and from then on, it feels like this is sort of what Flip Flappers was aspiring to be all along. I think the final few episodes did a good job bringing everything together and proving that there’s a method to the madness involved in this show. It may be a little hard to wrap your head around the story, due to the emphasis on metaphorical concepts, but the coming-of-age tale that’s hidden underneath the magical girl exterior of Flip Flappers is something that a lot of people can relate to and can probably appreciate nevertheless. Rewatching this a second time helped me understand some aspects of the story a little better—and gave more meaning to the earlier episodes—but I probably can’t say that I was able to make sense of everything that happened. Still, from a storytelling point of view, this was a lot different than what we’ve become accustomed to as yuri fans, and even though there were some minor flaws here and there, the story is definitely worthy of some praise. Sorry, Salt, Hidaka, Sayuri, Toto, Yuyu, and everyone else. Each of them had their own appeal and were perfectly fine characters, but this part of the review will pretty much be all about Cocona, Papika, and Yayaka. For me, there was a big difference in how I viewed Cocona and Papika, at least early on. Cocona seemed like your standard anime protagonist, but I felt like she was overshadowed by the world of Pure Illusion itself. As has already been stated, the lack of exposition early on probably didn’t help matters any, yet it was impossiible not to instantly take a liking to Papika. Her carefree attitude may have clashed with Cocona’s safe and bland demeanor, but I thought that she was charming and perfect for the show. Over time, I was able to warm up to Cocona, though, Papika is still best girl, as far as I’m concerned. And then there’s Yayaka. As Cocona’s longtime friend, she immediately butts heads with Papika, and as she comes to play a bigger role in the story, I kept liking her and her defiant attitude more and more. Pretty much as soon as Cocona and Papika meet, the yuri sparks fly, and by the end of the show, their love for each other is essentially one of the overriding themes of the entire anime, so I think yuri fans will have a lot to like about this show. Lost in this Cocona x Papika lovefest is the fact that Yayaka obviously also has feelings for Cocona, so there should be no doubt that this show is pretty gay. From the downpour of yuri imagery in episode five, to nearly the entirety of episode seven, to so much more, I think Flip Flappers should easily be 2016’s flagship yuri/yuri-ish anime. Probably the first thing one notices while watching Flip Flappers is that it looks good. Like, really good. Studio 3Hz is a newer studio that’s not as universally lauded for their animation as KyoAni and some of the more established studios, but they’ve been producing some quality work, with this probably being their best effort to date. Fans of sakuga will be in heaven, as there’s a wealth of highly-stylized, over-the-top scenes that are absolutely gorgeous to look at. In the short video above, you’ll see what I’m talking about. Nice, huh? Backgrounds and the general art style are also very nice, so, visually, this is an anime that just oozes style and is a visual tour de force the likes of which yuri anime fans probably aren’t accustomed to seeing. Aside from the awesome OP and ED (both of which I think are the best of the fall season), the audio does an admirable job of trying to keep up with the visuals and do justice to the strange adventures that Cocona and Papika go on in Pure Illusion. The background music in particular is quite nice, and among the overall impressive production values, it’s pretty easy to overlook just how commendable the sound is. Simply put, it may not be as noticeable or impressive as the animation is, but the audio is another area in which Flip Flappers stands tall. If you’re someone who’s been looking for something a bit different in your yuri anime, look no further. 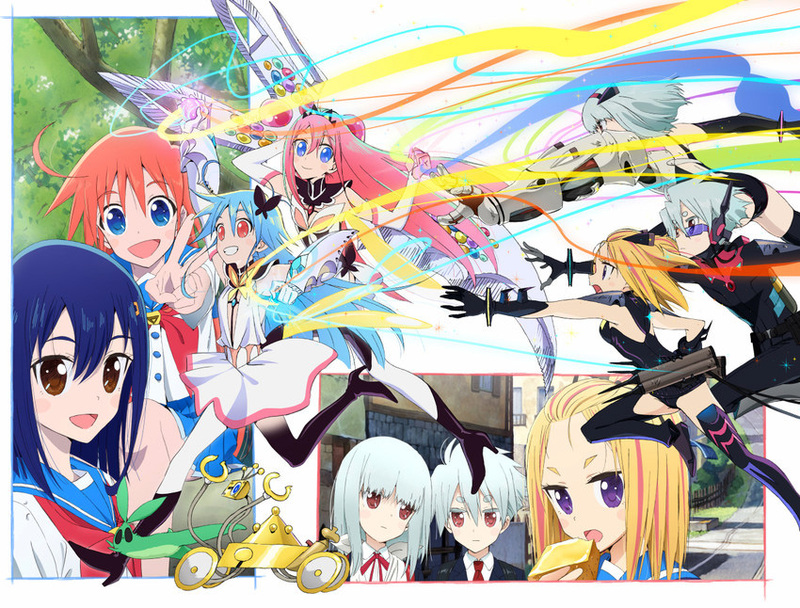 Flip Flappers takes gorgeous visuals and marries them to a metaphorically-rich story of adolescence that probably features more than enough yuri to satiate fans’ interests. It’s not the easiest anime to understand, so if you’re into Ikuhara’s works, this might be of some interest to you. By all accounts, this show is gonna completely bomb on the sales front, but at the very least, it still succeeds as a form of artistic expression. This entry was posted in Anime, Anime Review and tagged Flip Flappers by Rock The Vogt. Bookmark the permalink. Visually, Flip Flappers is very appealing. Unfortunately the story just couldn’t hold up in the end. Thanks for sharing your thoughts. I enjoyed the early episodes, seeing Cocona x Papika on their adventures. But I really disliked the finale. Most everything was explained, but the plot felt so much simpler and definitely derivative, lacking the subtlety I loved in the early stages of the story. And just like Evangelion, the animation suffers greatly in those last episodes. I love, love, love the show’s main pair, but I couldn’t love the show as a whole. There at the end, a lot less was left to the imagination, so I can understand that. And just for trying to do something different, I enjoyed it quite a bit. We could use more shows kind of like this. For me this show was pure eye candy and i am glad i watched it every week. One question has been stuck in my mind since it ended. Do you think it suffered from being aired in the same season as Izetta? Personally i had room in my heart for both of them and more but still the fear is there…..
That probably didn’t help, neither did the fact that it’s an original work, so it was kind of an unknown commodity that didn’t bring with it any fans from a manga, light novel, or anything like that. I’m glad to see some Flip Flappers recognition here, as it seemed strangely absent from such a stellar show with quite the amount of yuri. At least you admitted that you probably sold it short in the Yuri awards. well, I guess I’m a little bias, Flip Flappers is very much my type of anime. I value the experimentation and boldness in anime. Even if they aren’t perfect or stumble, they at least tried something crazy and that counts for something. And the essays people have been writing, and the talk the show has generated has been amazing. Also, I’m a huge sucker for underdogs, and Flip Flappers was a big underdog of the season. A nobody studio that’s produced barely anything hires a first time director to make an original anime. Especially an original anime that’s trying so hard and has so much passion behind it. To see it go mostly unrecognized, and I’m not even talking about here, is kind of sad. I hear the BR/DVD says were abysmal. I get that not everyone was as thrilled about the series as I was. The show isn’t for everyone, not everyone is going to want to go on this journey, and not everyone that loves going on the wild ride is going to enjoy getting off the ride 2/3’s of the way into the series for a more standard plot centric conclusion. I did though. 9/10, easily my favorite Yuri anime of the year. The show seems to have pushed the right buttons, so even if it is a financial failure, at least it’s inspired some people and has sparked discussion. Not every anime can say that. Flip Flappers was so great, it was a real roller coaster of a story! You never knew what the next episode would throw at you. It kind of reminded me of Kill la Kill for the general vibe of it. My favorite was the super saiyan wedding dress transformations! As for Amanchu…Hey, they were both good choices! You just can’t go wrong with either. Give that last episode of Amanchu another watch and see the love again, or their first meeting again in the first episode. What cracks me up is every time I try and remember Papika’s name I can only remember Pikari’s…so I guess I still lean on the Amanchu side of things. The ending 3 episodes were poorly managed in terms of time; they were overly repetitive on the same theme – of choosing your own path (ironically to follow somebody else – the yuri marriage is beautiful!). A fine theme explored throughout, but it ditched the other themes of identity and sexuality (unless you look at Papika’s hand placement when they’re on the piping in the last episode!) that it discussed – and curiously forgot to “finish” Yayaka’s arc (they were so close to a conclusion though, they just needed Cocona’s input to finish it). If it ended a tad better, I would have said it’s amongst my favourite all time anime. As someone who did really enjoy the show I have to strongly disagree with you here. Whatever you think about the execution the show was still beating you over the head with identity themes for the last three episodes, heck Mimi transformed Cocona into a copy of herself at one point. By choosing to make her own choices Cocona is reclaiming her identity from her mother. This fits with the world views of the psychologists the show is paying homage to as well. The Jung like shadow version of themselves that both Mimi and Salt confront also tie into the identity theme. I really don’t think the sexuality aspect was left behind either, in episode 7 the succubus Papika asks Cocona: “does it really have to be the Papika you know?” right around the time she pretty directly questions the sexual aspect of their relationship. In the final episode Cocona responds with “it has to be you” after telling her she loves her back. There is nothing platonic or familial about the way that scene was handled, or Papika’s emotional response to it. We have the whole Yayaka subplot that runs into those last three episodes to show that the relationship Cocona and Papika have is different than one she has with a close friend. And as short as it was the beginning scene of the last episode also gave us a reason for Papika’s attachment to Cocona that wasn’t related to Mimi. As for the final pipe scene an aspect I found more important than Papika’s hand placement was how comfortable Cocona was with Papika smelling her when compared to the first time they met. Another easy to track evolution of their closeness and Cocona’s growing confidence can be found if you watch all the times Papika and Cocona ride the hover board together which was capped off pretty nicely with their affectionate ride off into the sunset. I’ve seen others complain that Yayaka’s arc was unfinished but I don’t really agree there either, Cocona responds to her apology even while mind controlled and saves her from Mimi in the next episode. To me Yayaka’s arc ended when she looks at the couple in front of her, says “those two, it’s just not fair” and begins to move on. It’s pretty safe to say that this is one of my favourite anime ever. Thanks Rock The Vogt for the review. This was by far my favorite anime this season (and probably this year). I don’t see it often compared to FLCL, but I found them to be very similar in many aspects. The coming-of-age story was handled very well, and I appreciated the metaphorical aspect of this show in much the same way that I enjoyed it in FLCL: these shows treat the audience like its very smart, and doesn’t beat you over the head with information. In the end though, I actually found this story more compelling than FLCL, for a variety of reasons. While I could (and intend to) write an analytical essay about the themes and symbolisms of Flip Flappers, I think that for now, it will suffice to say that this show has earned a very dear place in my heart. Also, it was this review that pushed me to watch it in the end, so I can’t thank you enough for that! This show seems to be inspiring the ones who did see it to share their thoughts, and that’s pretty awesome and something that would be great to see happen with other yuri shows. Papika makes me think of Ponyo. Just the way she moves and talks. And how childishly excited she is about everything.